Dr. Dan Hogan was an absolutely amazing officiant for our wedding. Not only did he step in to officiate our wedding late in the game, due to special circumstances, but he led our wedding in the best ceremony that we could have asked for. He took the time to get to know my husband and I before we were married and made our ceremony very unique, personal and memorable. He not only touched us, but also our guests, many of whom commented on how impressed they were with him and his service. His wife also attended the events and they fit in like they were always a part of our family; mingling with everyone at both the rehearsal/rehearsal dinner as well as the events on our wedding day. It really felt like we had a family member officiate our wedding ceremony... what more could you ask for than that?! My husband and I, as well as our friends and family who attended the wedding, would HIGHLY recommend Dan (and wife Nelda). We had a wonderful and beautiful ceremony with Revered Dr. Dan Hogan. He was very helpful and communicative during the whole ceremony planning process! Dr. Dan Hogan is the best!!!! He was very professional. He took his time to get to know me and my husband before our wedding. He is a man of god. I could not have asked for anyone better to be apart of our wedding g day! Thank you so much!!!! Helping make our wedding special! We were so blessed to have Dr Dan officiate our wedding. He kept in constant contact, making sure all of our needs were met. He helped us with our vows, and made everything very simple to follow. Most of all, Dr Dan made us feel as if we had known him our whole lives. ...Like family! I must also add that his wife, Ms. Nelda, was very kind as well and made sure all of our paperwork was in order for our marriage license. 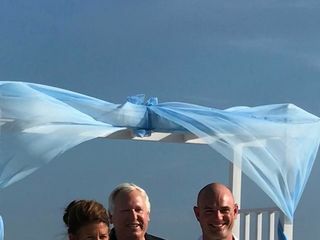 When I found Dr. Dan Hogan on Wedding Wire, I had expected an officiant. However, Dan is more than that. He is a patient guide who will provide as much - or as little - support as you want. He provided inspiration for my ceremony by helping me design it on paper and recommending how to execute. There is no ego here - just a man who is interested in making your wedding (my wedding) the most beautiful experience that I would allow. And that is exactly how I described it - BEAUTIFUL. I am so very grateful to him! 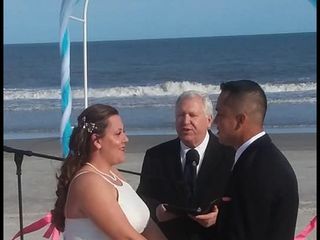 Perfect officiant for an amazing wedding. Dan was above and beyond what we expected. His punctuality and professionalism was exactly what we had hoped and more. I would recommend him to anyone getting married. Dr. Hogan was the easiest vendor to hire! He has a quick response time and will work with you on all the details of your wedding. He even went as far as asking what we wanted him to wear. He is kind, patient, and writes beautiful ceremonies that you can edit and customize. We are so glad we hired him! Dr. Dan was the absolute perfect fit for our Savannah wedding! He was so incredibly warm and very helpful throughout the whole process. From planning our ceremony to offering a form of pre-marital counseling via a Myers Briggs Personality Test. He was flexible and accommodating on being available to meet in person or correspond through email. Our friends and family have constantly complimented our ceremony with Dr. Dan’s wording and overall presence. We recommend him a thousand times over and can’t wait to stay in touch with him throughout our marriage. Dan was amazing to work with from beginning to end! We were planning from a distance so communication & follow up was very important to us when it came to our vendors. Dan couldn’t of been more attentive. He always got back to us so quickly & was always so kind. The ceremony itself was very beautiful. We highly recommend him! Thanks again Dan for helping to make our wedding day the best day of our lives! 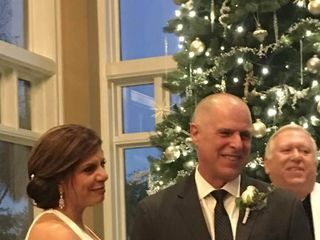 My Husband and I couldn’t have been more pleased with our experience with Dan Hogan as our officiant. He was able to personalize our ceremony to what we both wanted and made it so incredibly special for both us and our guests. Thank you Dan! He made the day unforgettable for us! It was an incredibly touching and heartwarming wedding ceremony for all of us! Dr. Dan was amazing! He made our day so special and I would highly recommend him to anyone. He was responsive, caring and took the time to get to know us. We are so glad we chose him to officiate our wedding! Dr.Dan Hogan made our wedding ceremony such a special event. He got to know us and added such a personal touch to our vows. Thank you for being our officiant and a part of our marriage union. Dr. Dan Hogan made my daughter's wedding a sacred and joyous event. 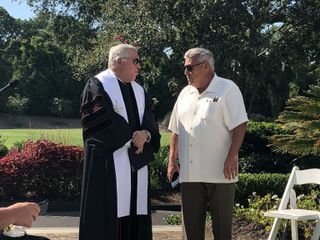 He provided some beautiful suggestions for the ceremony and allowed us to add some additional changes that made it special for everyone attending. We had some typical unexpected surprises that he handled well and kept the ceremony dignified. He was very quick to respond to our emails and phone calls and was showed up early for the rehearsal and ceremony. Dr. Dan is truly a spiritual man and a professional minister. I would highly recommend his services. Dr. Hogan is an excellent choice! and calmness to a stressful day. I am so grateful that he was our officiant and participated in our wedding. It was such a pleasure meeting Dan and his wife! Our ceremony was perfect and Dan made us feel so comfortable throughout the entire process. He was extremely helpful during the planning process and graciously accommodated our unique requests. Highly recommended! 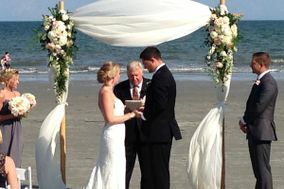 Dan was great to work with for our ceremony on the beach in Hilton Head! He personalisonalized the ceremony and it seemed like we had known him for years. He is very accommodating and friendly and quick to respond. We would certainly recommend him to anyone getting married at the beach!! 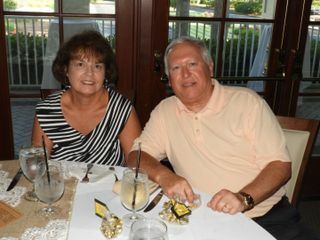 This past August my parents celebrated 50 years together and renewed their wedding vows in Hilton Head Island, SC. I planned the event for them at a distance from NJ. Rev. Dr. Dan Hogan was highly recommended to us by another local officiant (Betsy Peterson) who was unavailable on our date. From the start, Dan made planning the event a little easier through vendor recommendations and by explaining what to expect from the area, the environment and the climate. He was always quick to respond both by phone or email and easy to work with. 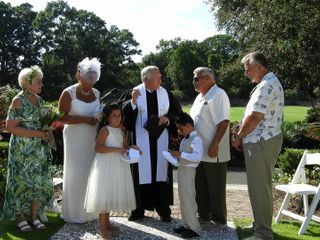 He provided us with the ceremony text via email a head of time for us to review and make changes special to our family. Although we were only able to meet on the day of the vow renewal (due to our schedule), he created the perfect ceremony. During the ceremony our participants and guests were engaged with both laughter and tears. He helped to make my parents “second” big day a great memory for us all. For these reasons, I would highly recommend Rev. Dr. Dan Hogan as an officiant. Thanks!!! Dr. Dan Hogan was absolutely wonderful in handling our wedding for us. Always responding and offering his time. The wedding was fantastic. Very professional! We definitely reccomend him! We thought Dan was great, the ceremony was beautiful and he accommodated all of our needs! Dr. Dan Hogan was wonderful. He worked with us to make the perfect vows and ceremony. He customized it to match exactly what we wanted. He was super friendly and prompt at responding throughout the process. On the day of our wedding when it was raining and we had to move the ceremony he worked with us to cut down the ceremony right at the last minute so that our guests didn't have to stand for an extended period of time. 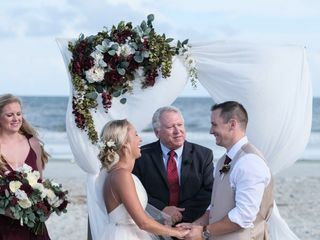 I would absolutely recommend that you use Dr. Dan Hogan as an officiant, you will have the perfect customized ceremony! Dan was very informative, caring and best of all helped me to stay calm through the planning process. We had some unexpected changes for our wedding and Dan was able to jump right in and make things work perfectly. So happy to have found the perfect officiate for our special day. WeddingsAndVows were absolutely amazing to work with as we planned out the ceremony for our destination wedding. We loved our vows and even had the W&V team at our rehearsal dinner which was amazing to have someone to say a few words before we ate. I would HIGHLY, HIGHLY recommend WeddingsAndVows for your Big Day! !